Sheffield Cathedral is ringing the changes as it prepares to install the church's first new bell in more than 45 years. The £20,500 instrument, paid for following a three-year fundraising appeal, will add to the cathedral's existing set of 13 bells and will help ringers to train more beginners. It will be lifted into place next month, after being blessed on October 1 in a special service by the Bishop of Sheffield, the Rt Rev Pete Wilcox. The bell will be hoisted up into its chamber from the floor of the cathedral through specially-designed trap doors. The Rev Keith Farrow, canon missioner, said that although the cathedral has a 'fine set of bells', they were quite heavy and ringers needed 'considerable training'. The church's largest bell, the tenor, weighs almost two tons - the new addition is just six hundredweight, a little over 300kg. Since at least 1745, the church bells have been sounded by the Sheffield Cathedral Company of Ringers. They are rung twice every Sunday, as well as on other special occasions. "Although the thirteenth bell gives the company the option to ring the 'middle eight', this is still quite heavy for learners," said Rev Farrow. "This additional treble bell will provide a light six, which is ideal for training new ringers, and a light ten which is suitable for ringers with less experience. 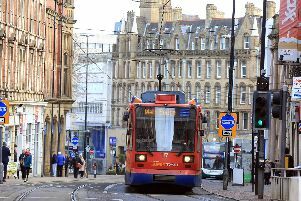 It will enable the company to train more beginners, ensuring their centuries-long service to the city of Sheffield can continue." The present ring of bells - in the key of C sharp - was cast in 1970, replacing the previous set that had been in place since the early 1800s. Records show there was a ring of four bells in the tower at least as early as 1559. Rev Farrow said the new addition was provided by Whites of Appleton, an Oxfordshire firm founded in 1824 that can lay claim to being the oldest continuously trading bell-hanging company in the UK. The casting was sub-contracted to the Whitechapel Bell Foundry - Britain's oldest manufacturing business. Established in 1570, the London foundry has cast some of the world's most famous bells including Big Ben and the Liberty Bell in Philadelphia, USA. The same firm cast all the cathedral's older bells in 1970, and the new one was among the last to be made at its historic Whitechapel site before the company moved to another base. Money has been pledged by different sources. The Yorkshire Association of Change Ringers Bell Fund is giving £3,000, and the Sheffield and District Rangers has offered £1,500. The ringers themselves have secured a grant of £2,500 from HSBC, with another £2,500 coming from the Sheffield Town Trust. "Together with other fund raising initiatives and personal donations, the company has raised nearly all of the £20,500," said Rev Farrow. "They will be pleased to receive any further donations to cover the costs of installation." The scaffolding now in place outside the cathedral is unconnected to the bell, Rev Farrow pointed out - instead, a new lead roof is being laid. Bell-ringing practice happens every week on Thursday evenings.